IBM® defines a smarter city as one that makes optimal use of all available information to better understand and control its operations and optimize the use of resources. There is much information available from different sources. However, city officials often lack the holistic view of the city's operations that is required to respond to the citizens' needs in a timely manner and use the city resources wisely. IBM Intelligent Operations Center delivers a unified view of city agencies, providing three primary elements for successful management of cities: use information, anticipate problems, and coordinate actions and resources. Chapter 1 of this IBM Redbooks® publication introduces the IBM Intelligent Operations Center solution. The chapter provides a high-level overview of its features, benefits, and architecture. 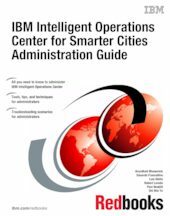 This information is intended for city officials and IT architects that must understand the business value of IBM Intelligent Operations Center and its architecture. The remaining chapters of this book focus on information that help IBM Intelligent Operations Center administrators perform daily administration tasks. This book describes commands and tools that IBM Intelligent Operations Center administrators must use to keep the solution running, troubleshoot and diagnose problems, and perform preventive maintenance. This book includes preferred practices, tips and techniques, and general suggestions for administrators of IBM Intelligent Operations Center on-premises deployments.